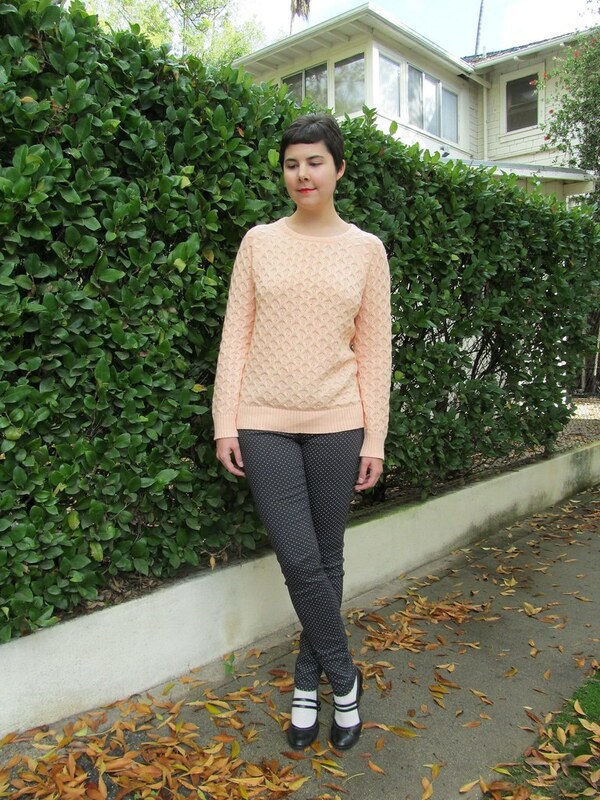 The peach of this sweater is more vibrant in real life, so much so that…I think it might be a granny sweater. It reminds me of my dad’s mom’s bathroom at the house where he grew up, which looked like it hadn’t been redecorated since the early ’60s. And I didn’t even find this sweater at a thrift store. It’s from Forever 21. It’s actually been “cold” in Southern California lately, which is why I’m wearing socks with Mary Janes. I don’t own any boots. I need to buy some, but I can’t seem to find the right pair, plus then I’d have to figure out how to wear them with my wardrobe and I’m kind of clueless about styling boots. You look so cute here, Heather! The shoes complete the outfit!